There’s no denying it; fall is HERE. Leaves are changing, nights are cooler, and seasonal chores are upon us. Soon enough, you’ll be snuggling under blankets and spending a LOT more time indoors… So grab your fall cleaning list: We’ve got a few seasonal “must-dos” to get your home primed and prepped for winter. By now, that bright white grout of yours is showing every single summertime stain and blemish, such as black mildew stains. It’s super hard to keep clean on a regular basis, so add this task to your fall cleaning list. 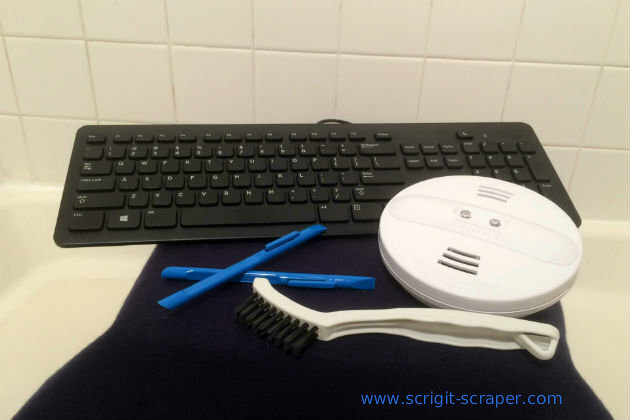 To clean, use your Scrigit Scraper cleaning tool to scrape off any soap scum and other substances stuck to the grout. Also use the tool to clean corners, edges and the shower door track. Then use a spray bottle containing equal parts vinegar and water. Spray the solution on your kitchen and bathroom tiles and grout. Let it sit for at least five minutes. Scrub your grout with a narrow grout scrub brush or a toothbrush and the tile with a scrubber pad. Then rinse. For remaining stains, create a mixture of equal parts chlorine or oxygen bleach and hot tap water in a plastic container. While wearing rubber or plastic gloves and old clothes, dip strips of paper towels or toilet paper in the solution and carefully place on the stained grout. Make sure you have plenty of ventilation when using chlorine bleach. Let sit for about 15 to 20 minutes. Lift some of the wet paper off to see if the stains are gone. If not leave on another 5 to 10 minutes. Then rinse off. Once winter comes, you’ll probably be spending a lot more time curled up in front of your computer and TV. So prep the surfaces you’ll touch most. Use a dry cloth to wipe away all visible articles from your remotes and keyboards. Then follow up with a pre-moistened disinfecting wipe. Wipe down the entire surface of each item, but don’t forget the details! Use your Scrigit Scraper with the wipe around the flat tip to reach into each and every crevice. There’s likely to be food particles and dried, sticky residue left from snacking (and any other “messy” activities we get into on a daily basis. It’s one of the most important chores on our TO DO list, but it’s also the most easily forgotten. Your smoke alarm will chirp when it’s time to change the battery, which almost always happens to be in the middle of the night or when we’re rushing out the door. Avoid the stress altogether by replacing the batteries every six months. Remove the cover, then unclip the old battery from its holder. Most detectors utilize a 9-volt battery. If you struggle to remove the battery connector, grab the flat end of your Scrigit Scraper to pop loose the battery. Then immediately replace it with a fresh one. If your smoke alarm is more than 10-years old, then replace it with a new one, preferably with a sealed-in 10-year battery. Don’t leave the deep-cleaning to springtime! Enjoy your time indoors this upcoming winter by taking a few steps during your fall cleaning to ensure it’s a clean, safe space. Keep your Scrigit Scrapers nearby to ensure you’re always able to tackle the job – – – and enjoy the season!